Flute-noses have been calling upon the wind for years to breathe life into the land of Asposia. Without their unique power, all of its inhabitants would surely perish. So then, what happens when the only people who can sustain life are hunted down and rounded up like criminals? The Inner World: The Last Wind Monk is a point-and-click fantasy game by Studio Fizbin. Though it’s a sequel to their 2013 game The Inner World, you’ll be able to grasp most of what’s going on in this game without any context. The things that make The Last Wind Monk truly enjoyable are its art style, world building, and puzzles. All of the characters in this game, from the main cast to the assorted citizens of Asposia, are portrayed in such a charming way. Robert the clueless flute-nose and his feathered friend Peck provide some humorous moments, while their accomplices Laura and Libretta bring exposition and interest. Their voice acting, especially Robert’s, seemed too slow and drawn-out at first, but it grew on me after a while. On the surface, The Last Wind Monk appeared to be borrowing heavily from Avatar: The Last Airbender, but that was largely the opening sequence that emphasized tracking down the last remaining wind monk and how only he could unite the land again. Upon digging deeper, I found an intriguing and original world in Asposia. It’s somehow dystopian while also full of fantasy elements and whimsy. The cartoony graphics combined with a country on the brink of disaster somehow completely worked. The story could be a bit hard to follow at times. What I gathered is that Conroy, a power-hungry Asposian, created mechanical monsters that he tricked people into thinking were wind gods. Then at the last moment, when Robert (who is also the heir to the throne) stopped Conroy’s evil plot and turned him to stone, the situation got entirely misconstrued. Everyone was tricked into believing that Conroy was trying to protect them from the heartless gods while the flute-noses were the ones summoning them in the first place. Those that subscribe to this version of history have formed their own oppressive group, the Conroyalists. However, even though the details got muddied along the way, it’s easy to understand the building blocks of the narrative. I could recognize aspects – such as discrimination over superficial things like the type of nose you have, or fear-mongering by a loud-mouthed leader to control his people – playing out in real life as well. There’s also the chance that further clarification will come in later chapters. Now, I’m someone who has a love-hate relationship with puzzle games. They’re a lot of fun, until I get stuck on something seemingly simple and walk away for days at a time. That was never the case with The Last Wind Monk. 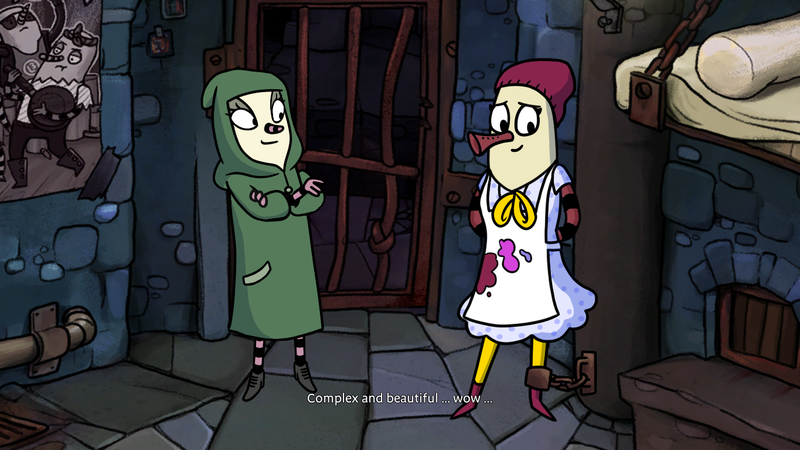 This point-and-click title employs something I wish a lot of others would: a hint system. With the Asposian help system, you can get as much or as little guidance as you want. Do you need a bit of direction on where to go? Are you in the middle of solving a puzzle but can’t figure out the next step? Just keep clicking on the lightbulb icon until you reach the level of information you desire. It’s like managing your own nuanced difficulty settings, and I really like that. As a whole, I would say my time with The Last Wind Monk was well-spent. I only got to play through the first couple of chapters, but I’m interested to see where the game goes when it’s released later this month.